We’ve reviewed Crakroc here before. It’s not a huge deal, really, just one of the best confections we’ve ever had. No, it’s not bark-although it sorta looks like it. 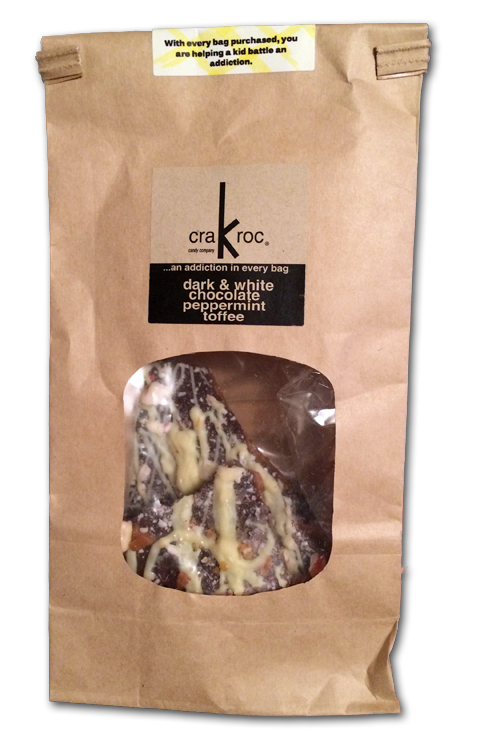 Crakroc is similar to bark in that there’s a layer of chocolate, but that’s where it ends. It always has chocolate & toffee, and somehow achieves a slightly chewy yet still a bit crunchy consistency. Additionally, you get extra ingredients depending on what kind of combinations they dream up. 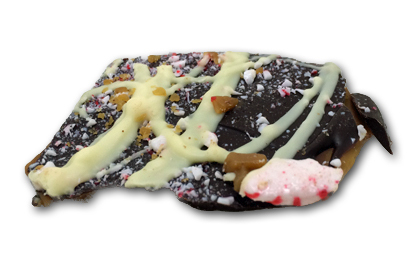 Something about dark & white chocolate with peppermint just FEELS holiday-ish. And remember from last time we reviewed them, Crakroc does good things with portions of their profits so yay Crakroc! It’s a modern art masterpiece. Stuff just splattered everywhere. A slight cross-section view will give you a better idea of how the whole thing works. So here’s the thing-unlike my son, peppermint is kinda boring me. It’s “good”, but…uninteresting. Having said that…this is my favorite flavor of Crakroc I’ve tried. Peppermint turned out to be the secret ingredient I never knew I needed. 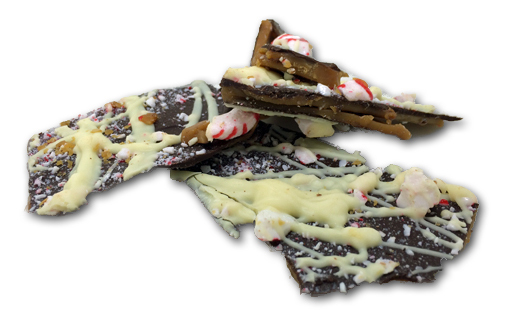 Because we have such a lush array of flavors like white chocolate, dark chocolate, and the salty toffee, the peppermint perfectly plays off them and adds a subtle zing that’s addictive. I love this. This is important though: don’t mistake this for bark. It’s not bark at all, it’s way better. Bark is good, especially the stuff my mom makes, but…it’s just chocolate with stuff on it, usually just crushed peppermint. Crakroc, with the addition of the toffee, moves it way beyond the bark world. I’ve tried a few different flavors of Crakroc, and while I do think this is my favorite, they’re ALL good. No one I’ve offered this to has ever done anything but ask for more. Click the link below, why don’t ya?